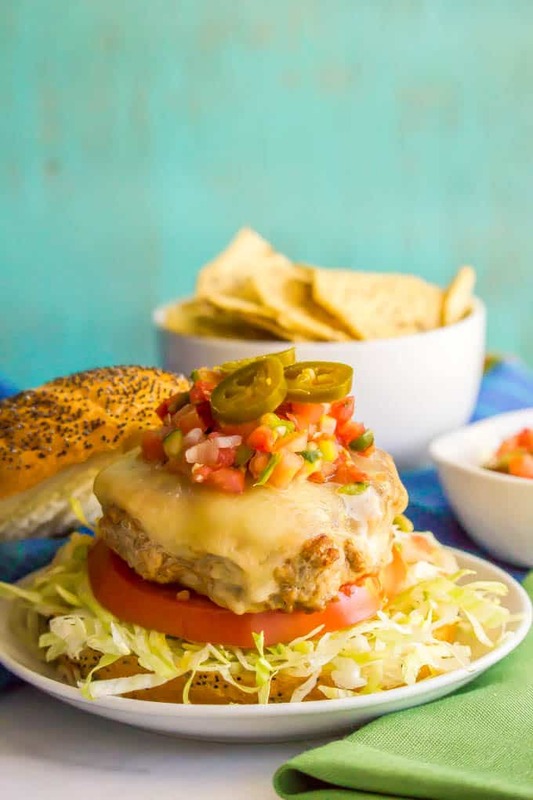 Fiesta turkey burgers have just 4 basic ingredients but create a little flavor explosion in your mouth! 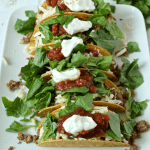 Add your favorite taco toppings and dig into these juicy, fun and delicious burgers! This post is part of BurgerMonth.com and grill giveaway with a group of fellow food bloggers and burger lovers. As always, all thoughts and opinions are my own. We are inching closer and closer to the long holiday weekend and I am OH SO READY! Today we continue to celebrate my undying love for burgers. Non-beef burgers that is. 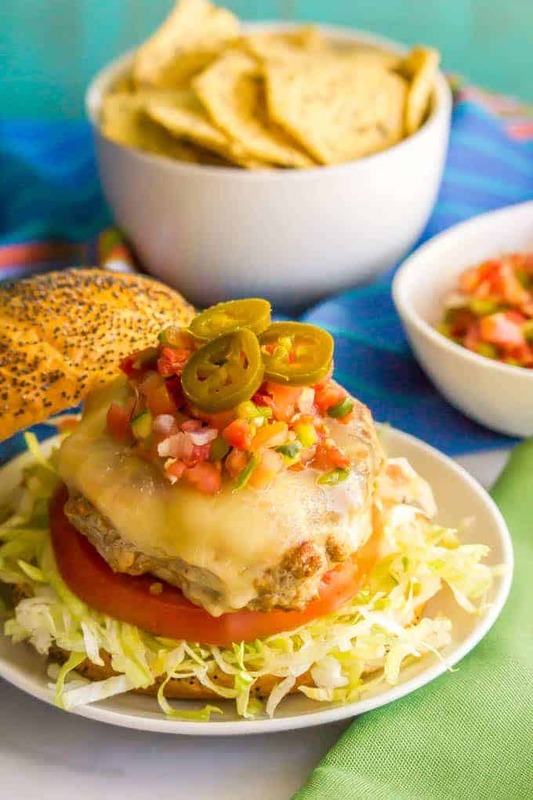 And today’s fiesta turkey burgers combine my love of all things taco with my love of turkey burgers. Oh, and my love of toppings because there are endless options here! Basically, these create a little flavor explosion in your mouth, which is pretty impressive since they have just 4 basic ingredients! That’s some winning summer fun in my book! 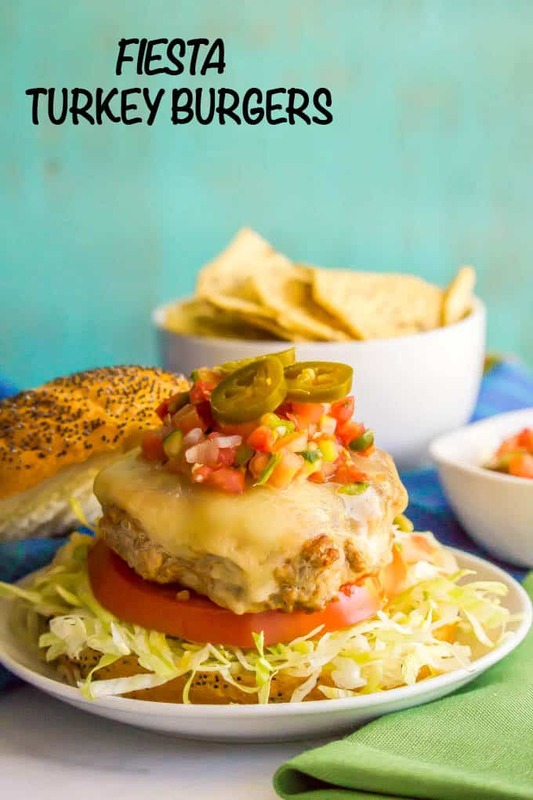 Juicy turkey burgers with taco sesaoning and melted cheese on the inside, plus all your favorite taco toppings that you can pile on top: more cheese, pico de gallo or salsa, avocado or guacamole, sour cream or Greek yogurt – you name it! PLUS, I’m joining with a group of other food bloggers who love and adore burgers to celebrate BURGER MONTH in May! Better yet – you have a chance to win a grand prize of Weber Spirit II E-310 gas grill plus tons of other weekly prizes of food and grilling tools. 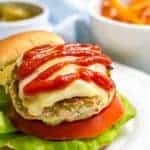 🎁 You can enter below the recipe card in this post and fill out additional entries (and get all the delicious prize details) at BurgerMonth.com. 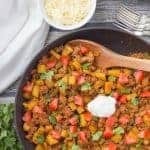 I use ground turkey (93% lean) but you could substitute ground chicken or ground beef if you prefer. 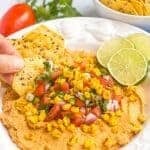 I use homemade taco seasoning but you could substitute store-bought. 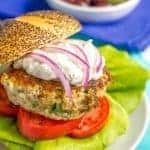 You can serve these turkey burgers in a regular bun or make a lettuce wrap if you want to be low-carb (and/or gluten-free). Need a few sides to round out your meal? 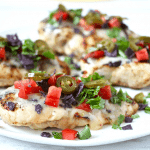 These fiesta turkey burgers go great with confetti brown rice or roasted potatoes, a side salad or easy summer salad with blueberries and would be great with my easy, foolproof corn-on-the-cob. Happy burger month everyone! I hope you find some new burger favorites and I hope you win the big giveaway! Remember, you can enter below – see just underneath the recipe card – as well as at the main BurgerMonth.com website. Last thing: I’m taking Monday off for the Memorial Day weekend but I’ll be back next Thursday with a new recipe. Have a wonderful holiday weekend if you’re in the U.S! 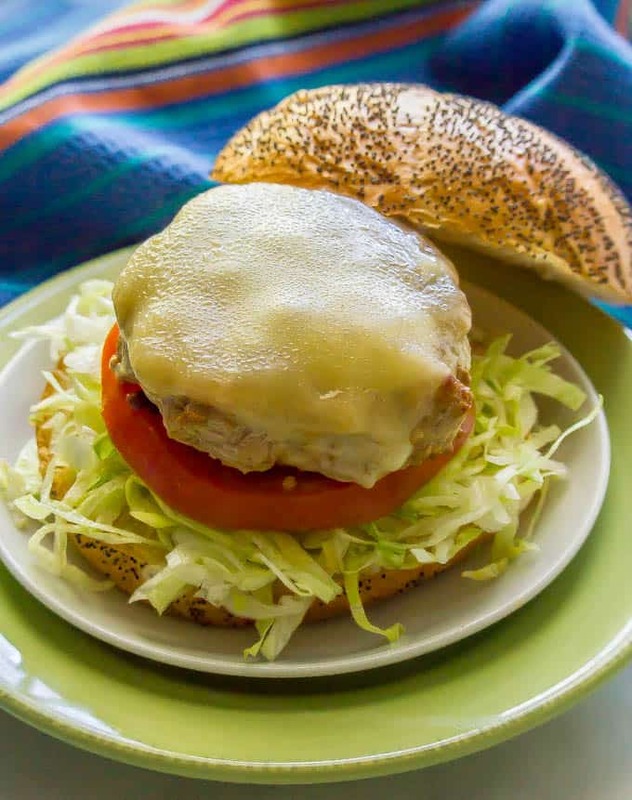 Fiesta turkey burgers have just 4 basic ingredients but create a little flavor explosion in your mouth! Heat a large non-stick pan over medium-high heat and add oil. Add burgers to pan and cook over medium-high heat for 5-6 minutes, then flip and continue cooking until done, about 5-6 minutes more. 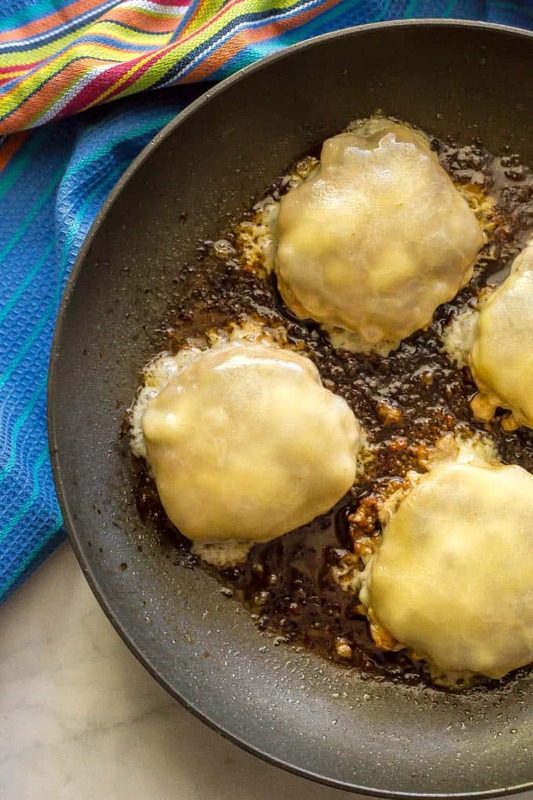 If you are adding sliced cheese to your burgers, you can do that when you flip them, so it melts. Let rest for 5-10 minutes before serving. Then add desired toppings and enjoy! P.S. A huge thanks to the #BurgerMonth sponsors, American Lamb Board, Anolon, Cabot Cheese, Melissa’s Produce, Microplane, New York Beef Council, Red Duck, Spiceologist, Veal Made Easy, and Weber Grills. Check out the other burgers and the giveaway details with more chances to win at BurgerMonth.com. 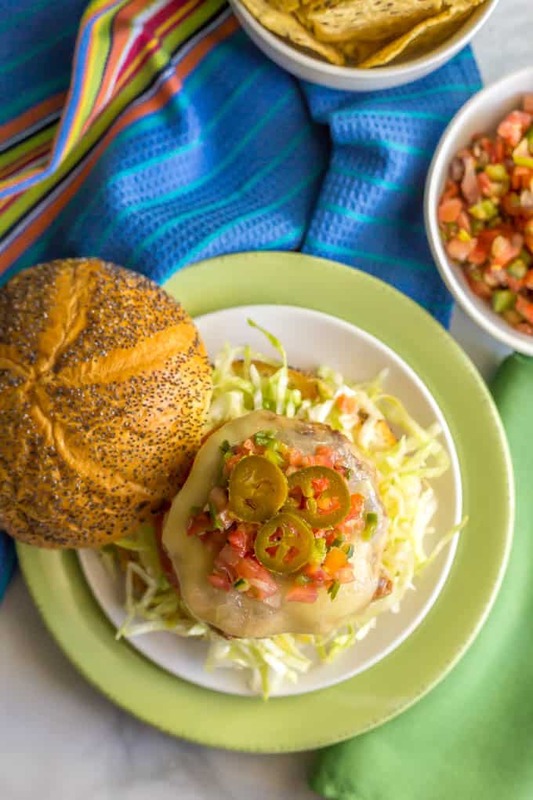 I’m digging those jalapenos on top of that turkey burger. I’d definitely order that!